All four full-length records will be remastered and will come with an extensive booklet. On top of that, every album will contain loads of bonus tracks! The records will be available on CD and LP, and of course digitally. Expect Born To Expire and Desperate Measures to be released in spring 2015! 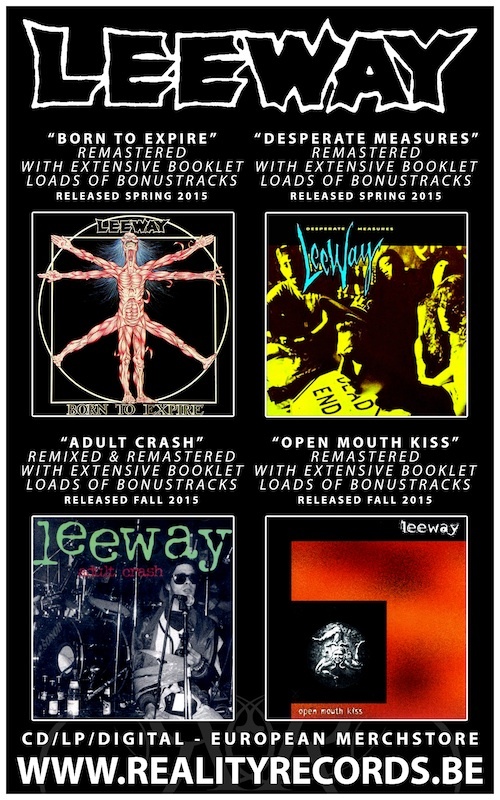 Adult Crash and Open Mouth Kiss will be released later on this year around fall/winter 2015! Tags: Adult Crash, Album, Born To Expire, CD, Desperate Measures, Download, Full Length, Leeway, LP, Open Mouth Kiss, Re-Release, Reality Records, Record, Release. Bookmark the permalink.